Parajuru is a small village located about 130 km south of Fortaleza. What makes this spot different from the other lagoons in Cerea, is that there are barely any crowds. This remoteness is perfect because you never feel like you are getting in the way others or vice versa. We are in Brazil, practising new tricks and often crashing and the fact that the beach is usually empty makes it a lot more comfortable for training. Other spots like Cauipe can get extremely crowded that that interferes with your confidence and riding. The small fishing village of Parajuru enables you to see the authentic culture of Brazil. There are barely any tourists, which I liked. Along the beach, the fishermen all haul up their wooden boats; which are amazing pieces of work. This spot is well-worth checking out if you are heading to Brazil. From June and January, the trade winds create ideal kiting conditions with wind speeds between 15 and 25 knots, and it almost never rains. You can expect the best conditions between August and November. The wind comes from the east/south-east and blows cross-onshore. The air temperatures are around 30c, and the sea is warm. I was there in September for two weeks, and not once was there not enough wind to kite. In the mornings, the wind generally came cross-shore and then at around midday, the wind dropped for a couple of hours (perfect for a lunch break!). Then at around two, the wind comes more onshore and picks up again. I found the strongest came in around sunset. The wind strength varied from 13-25 knots, but most days it was a consistent 17 knots. If you are staying in the Parajuru Praia Hotel, then there is no real need for any vehicle. The spot is directly in front of the hotel, and the village is a 5-minute walk down the road, so you are pretty much sorted! On one of the nights there was a party at one of the hotels, but apart from that, there was nothing else regarding restaurants or bars. I would say that if you were looking for a vibrant night town, it would be better to go to the bigger cities further north. Parajuru is just a small fishing village; there isn't much exciting going on in the evenings! If you go in the season, then I really doubt that there is no wind, but if that anomaly was to happen, then you could go check out the coast on a buggy or finally have to rest and take a day to recover from all the kiting you've been doing. Parajuru Praia Hotel (also called Parajuru Beach Resort). I am sure there are also other smaller hotels or houses if you check out Air BnB. Gabe Payne is currently a student at The World Class Kite Academy. He joined the academy in September and plans to stay for the next 2 years, as he travels the world, going to school, and training in some of the top kite destinations across the world. Been to Parajuru? What did you think? 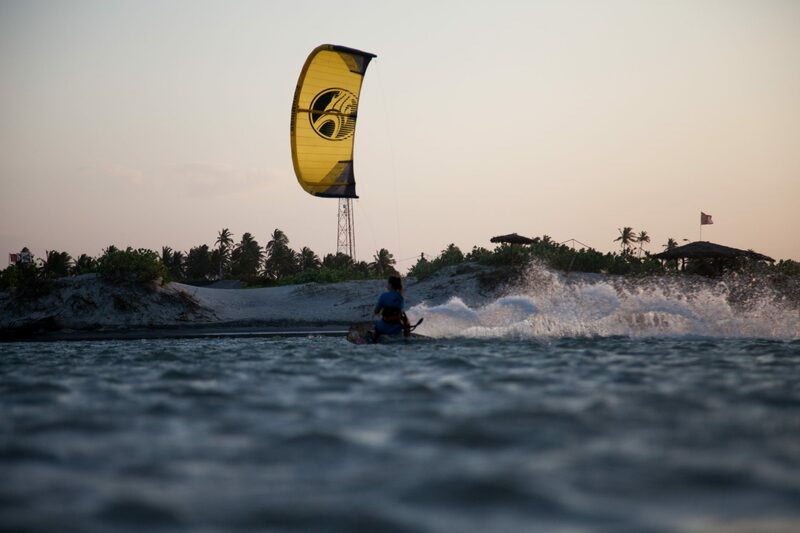 Where are the Best Kitesurfing Beaches in Parajuru? There is one beach, which has easy access by road. You can enjoy a mix of flat water or play around in the waves. The spot is larger at low tide when more of the sandbar is exposed. However, I am sure it has changed a lot since I was there. I noticed that in the two weeks I was there were new spots made and destroyed by the currents every day. It was cool to explore the new banks every day. When is the Best Time to go Kitesurfing in Parajuru?